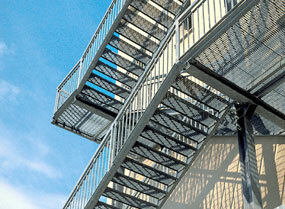 The standard range of stair treads in forge-welded grating is offered in three types of mesh. The square 34x38 for industrial applications, the classic 25x76 and the heel-proof 15x76 which is particularly ideal for emergency stairs. The stair treads can be made to the customer's own specifications.